In 1862, conflict and violence broke out between the Dakota and white settlers because the Dakota were not receiving payments, supplies or food after selling their land to the government. Without the payments, supplies or food, the Dakota were struggling and starving to death. The Dakota Conflict, as it was later known, resulted in far too many deaths which included 38 Dakota men hanged in Mankato on December 26, 1862, under the order of President Abraham Lincoln. The United States government officially recognized the Prairie Island Indian Community as a reservation in 1936, awarding them 534 acres. “Although poverty was still prevalent, the culture of home was redefining itself. The seeds of self-sufficiency were once again being planted in these sacred grounds,” according to Prairieisland.org. “Treasure Island started out as Island Bingo, a 20,000-square-foot bingo hall in 1984. It was so popular, it was only a few years later that gaming was expanded, becoming Treasure Island Resort & Casino. 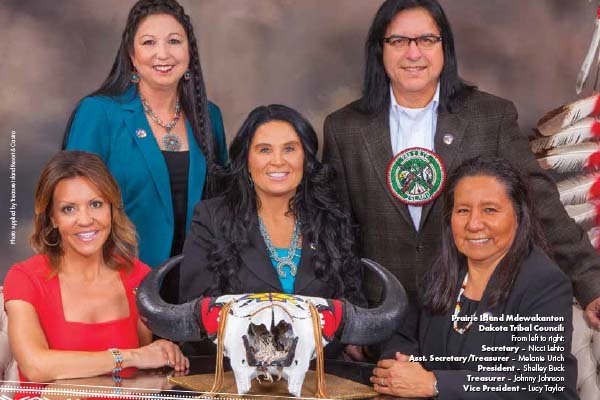 Because of the great sacrifices of our ancestors, we were able to have our compact, or agreement, with the state of Minnesota, signed by the governor,” recalls Shelley Buck, the current Prairie Island Mdewakanton Dakota Tribal Council president. With funds provided from Treasure Island Resort & Casino, the tribal members have improved their lives tremendously. “We have created revenue for our social services,” explains Buck. The tribe employs 10 police officers, with four more being hired soon. The funds support an education department offering tutoring and services in Red Wing schools. It also provides roads and parks, land and environment departments–all aspects of a successful sovereign nation. Buck continues, “If college students of the tribe maintain a C average or better and complete their degree, we provide 100 percent of college tuition costs for them.” The list of services being funded through the resort’s revenue goes on to include 100+ head of buffalo, a fitness center free to all tribal members and employees of Treasure Island, a health clinic and more. Treasure Island attractions include concerts, bowling, an event center, a spa, a casino, restaurants, a water park and more. “A few years ago, when we were building the water park to include a 350-foot lazy river, swim-up bar, hot tubs and pool, the spa seemed like a natural amenity to also include. As we aim to be a family resort, we wanted something for parents to enjoy while children played at the water park,” says Buck. “Many brides enjoy the venue because hair, makeup and nails can all be done on-site at the resort,” notes Buck. Events such as weddings, health fairs and expos, elder craft fairs and more are routinely featured within the event center. The Wave Spa offers services such as facials, massages, haircuts and colors, makeup, waxing, manicures and pedicures. If you’re visiting midweek, you can even enjoy a cocktail with your manicure during Martinis & Manicures on Tuesdays and Wednesdays. Talking about Treasure Island wouldn’t be complete without mentioning the stream of high-profile entertainers booked each year. Construction on the outdoor amphitheater was completed about a year ago. “It truly made Treasure Island a destination. Our outdoor concerts have been selling out! People love to be outside during the summer,” says Buck. The indoor venue can seat 2,800 while the outdoor amphitheater seats 15-18 thousand people. The popular Weesner Family Amphitheater at the Minnesota Zoo, for comparison, seats around 1,500, and the grandstand at the Minnesota State Fair accommodates 13,000 people, making Treasure Island’s new amphitheater addition a very impressive feat. “After we sold out our Matchbox 20 outdoor concert with somewhere around 14,000 people, we reconfigured the amphitheater to include permanent premium seating complete with cupholders. This brings our new maximum capacity to around 18,000 people per concert,” Buck states proudly. The resort is also part of the local music scene with Treasure Island’s Parlay Lounge, a popular venue for free entertainment. Minnesota’s top local bands perform every Friday and Saturday night with monthly drink specials and no cover. From a solemn moment in southern Minnesota’s wild past to the Mdewakanton’s “new buffalo” growing bigger and better each year, Treasure Island Resort & Casino is a destination with a rich backstory and a happy ending. Make your reservation today…the Island is calling. Gina Dewink is a writer and author living in Rochester with her husband and two zany children. Her thrilling mystery, Time in My Pocket, is available through Amazon and other book retailers.